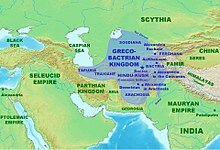 The Greco-Bactrian Kingdom was the eastern-most tip of the Ancient Greek world. It lasted between 250-125BC. It covered Afghanistan but also bits of Turkmenistan, Iran, and Pakistan. It covered a region originally conquered by Alexander the Great. Much of our information comes from the Roman Strabo. Much archaeology has been done in Afghanistan, especially in the cities of Aï Khanoum and Begram. The National Museum of Afghanistan has put on a touring exhibition about this kingdom. It has been shown at the British Museum and also in France, Germany and the Netherlands. Much other archaeology is on display in the Hermitage Museum in St. Petersburg, Russia. This page was last changed on 20 December 2018, at 19:55.